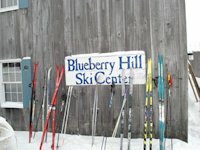 Blueberry Hill offesr 70km of ungroomed trails for cross country/nordic ski and snow shoe experiences. Enjoy the adventures of "backcountry" skiing and the comforts of well maintained easy to follow trails AND a place to come "home" to. The ski center will be open daily,from 9-5 daily offering soup and other lunch items. All trails users should be off the trails before the center closes at 5 pm and sign in and out each day. No trail fees will be charged. Skiing on groomed trails (packed and tracked for both skate skiing and skating as well as 5km of snowmaking) is available at nearby Rikert Nordic Center. The Ski and Snow Shoe center offers a warm place to gather, wax your skis and eat lunch. We offer homemade soup, hot drinks and other lunch items daily as well as ski and snow shoe rentals.
. Spring Skiing/Variable and changing. 15-18inches of new snow received on Friday. Deep powder skiing, and skied in tracks today. Warm and sunny. Excellent snowshoeing.